In our ongoing Embrace series we often explore the ability with groups of rings to have the centre stone sit in isolation, or be enhanced or accented by the addition of framing rings. Here the large white and diamond collar is literally based on Ming The Merciless from Flash Gordon, Why not! The second alternative accent was based on an Indian woodblock pattern for printing fabrics. 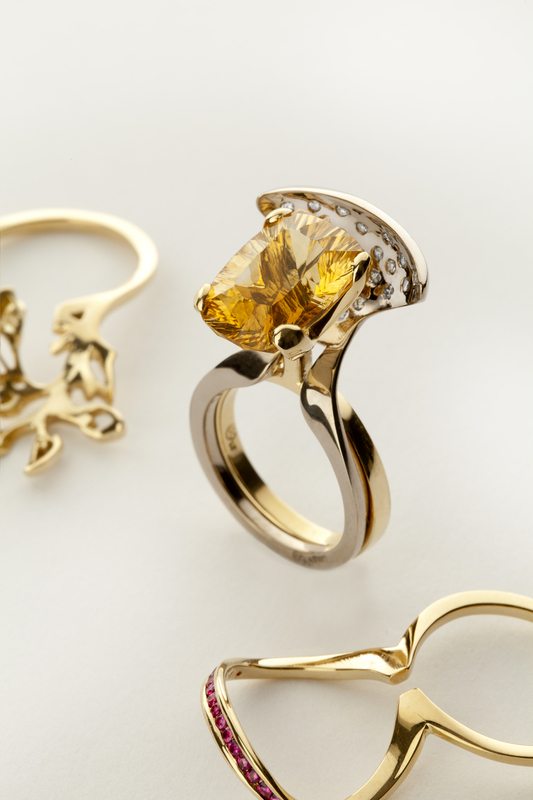 This makes a monotone effect when worn together, with the shape fitting neatly underneath the main citrine gemstone and it’s leaves peeping out to break up the silhouette of the ring. And finally a bold accent of red rubies arching up over the main stone as an optional extra.